Today we celebrated your very first birthday! We woke you up singing happy birthday and filled your crib with balloons - you were the happiest little boy and so excited! Me and Daddy decided we will have to make it a yearly tradition from here on out, due to the gigantic smile you had on your face and how much you loved it. 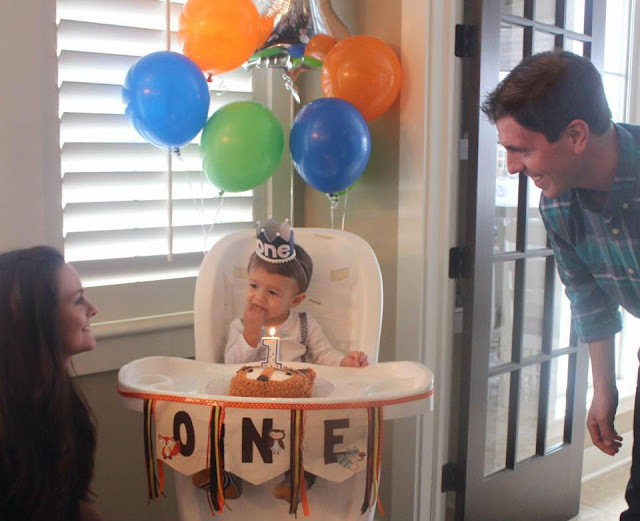 Today was also your first birthday party with all of our closest family and friends! In typical Camden fashion, you embraced everyone with your loving, joyful, and happy personality. You really loved playing with your number "1" balloon, eating your chocolate cake (let's just say you weren't hesitant at all and let out a big cry, which you never do, when we tried to take it away), playing with all the kids, and opening all your presents. Lately, you love to give other kids hugs and kisses and at your party you "tackled" a few kids trying to do just that. It melts our heart to watch - you are truly the sweetest boy. The party was so much fun and we were on cloud 9 being able to show you off. A few hours after you went to bed, I went into your room as you were sleeping and just held you in the rocking chair like the days when you were little. I thanked God for giving me the most perfect son, for keeping you safe this past year, for all of our ups and even for those challenging days in the beginning when I questioned every move I made as a first time mom. I just held you tight on my chest as tears rolled days my face because of how thankful I am to be your mom, the amount of love I have for you, and how I hope/pray to be around for as many of your birthdays as humanely possible. I have to tell you something about today, though. We may have only had one real birthday party for you this year, but celebrating you is so easy. That's because I've celebrated you every single day since the moment you were born. I wake up and look in your eyes and just smile that you are in fact my son. You have made your Daddy and I so insanely proud and we love you so freaking much...so much that it almost hurts sometimes. Watching you grow this year and spending time with you has been the highlight of my life. I know you won't remember the days we shared together this year going to swim lessons (my fav! ), to the park, to the mall, taking walks, or just playing in the backyard, but they are my most cherished memories. You are my biggest pride and joy and the best thing that I have ever done. Not only that, you have undoubtedly changed me as a person for the better. There is NOTHING more that I enjoy than being your mother. You've taught me how to be more patient, how to go with the flow and deal with change, and appreciate the little things in life. You've also taught me how to be a mother and I have to say, I think you did a pretty damn (sorry) good job. Just like tonight, at bedtime for the past 365 days, I've prayed to God and your Grandma Janet to keep you safe from harm and for you to always know how much I love you. I want you to always know that I am your number one biggest supporter and my love for you will only grow! You are my entire world...my everything...my reason why...and no matter if you're 1 year old or 80 years old, I pray you feel and know that. Thank you for making me a momma and for the best year of my life. Happy birthday, my sweet Cammy. Katie, this is so beautiful to read and I can only imagine how special it will be for him to read it himself one day! Wow..thank you for sharing this with us! So beautifully written and brought tears to my eyes (especially because I still can't believe how fast this year went for both of us!). I write a letter to each of my boys on their birthday and keep it in a journal for them, I figured since I failed keeping a baby book for either of them this would work! haha!! Enjoy celebrating your sweet, smiley boy!! I'm so thankful that you get to experience this..
What a beautiful post. Thank You for sharing this with us. What an amazing 1st year it has been for sweet Camden. So sweet! Your son is so adorable and it is so sweet of you to share it with everyone. Happy first birthday Camden! This was so beautiful, it made my heart ache, because I totally, completely understand everything you're feeling for your son, and words could never do those feelings justice, but even so, you did an amazing job expressing yourself. He is going to love to read this someday! Breitling doesn’t handbag replica per se mention all this, but I can tell you what the point of all these parts is. Replica Rolex Watches Interestingly enough, all of this is a source of great controversy in the traditional UK Replica watches watch industry. It has to do with the fact that metal parts are being replaced by non-metal parts. Watches Replica If the movements are still mechanical then why all the fuss?Some watchmakers are Designer handbags concerned that unlike .